Here's one for everyone who will be dressing up as this song's title for Halloween tonight. 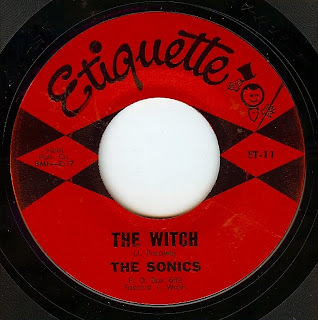 Or for anyone else who appreciates the raw, driving sound of Tacoma's finest garage rockers, The Sonics. 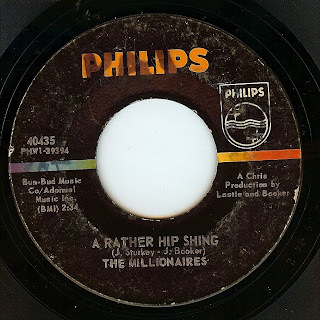 Note to potential wise guys: yes, this from an EP but it still spins at 45 RPM! Here's a storming raver from Australia's finest (and first to have a worldwide hit) The Easybeats. This is a track that was only released on the Australian "Easyfever" EP and just might be my favorite thing from these guys. 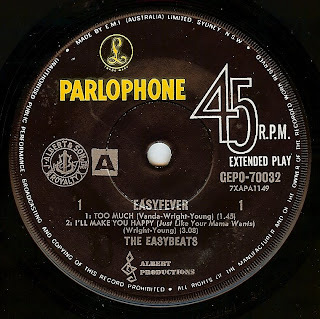 "easyfever" in fact was a term coined by the press to describe (just like "Beatlemania") Australia's rabid reaction to this group that caused near riots down under. 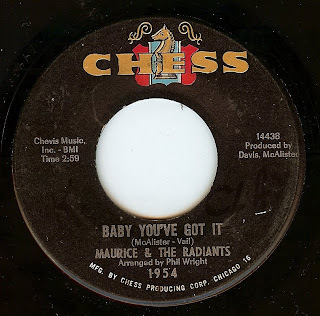 Shortly after The Radiants cut their biggest hit (the superb "Voice Your Choice") the group gave front man (and songwriter) Maurice McAlister top billing for this great record. Simply another fine example of the sophistication of Chicago soul. Minnie Ripperton is also singing the exquisite backing vocals on this track. Maurice left the group shortly afterwords and began cutting records with Mac McLaren as Maurice & mac. First off, let me apologize about the heavy surface noise on this record. It's the type of thing that doesn't stop me from enjoying a record and this is a tricky one to find. 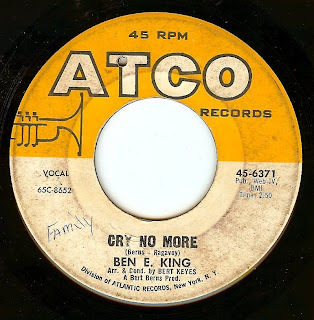 After leaving the Drifters, Ben had a glorious career (including "Stand By Me" which is not only one of the most popular oldies of all time but also inspired hundreds of other records, rhythmically; records that are affectionally known today as "popcorn"). Inexplicably, this incredible song wasn't a hit, anywhere. In this listeners' opinion, this track stands proudly next to "Stand By Me" and "There Goes My Baby" as Ben E's finest moments on wax (and perhaps my favorite). This is also another soaring, epic production by the legendary Bert Berns. 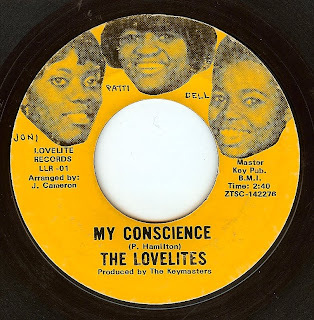 In this song, Philadelphia producer Jerry Ross "took on" the Motown sound full on with a group of young ladies that sound eerily similar to Martha & The Vandellas. 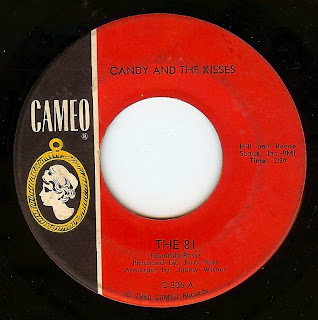 "The 81" is one of the more obscure mid-60's dances that went along with Martha's "In My Lonely Room", and this song cops the feel of that song pretty well, and adds another dimension (the production is almost Motown meets Wall Of Sound to my ears), topped off with sublime girl group vocals. I absolutely LOVE the twists and turns that the song takes, especially after each chorus. Sublime! 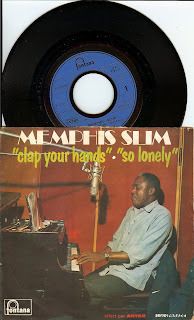 I was very surprised to learn that Memphis Slim cut a "beat" number like this (that was a big hit in France, apparently). But I guess it's not that surprising after all considering his career was full of uptempo blues. 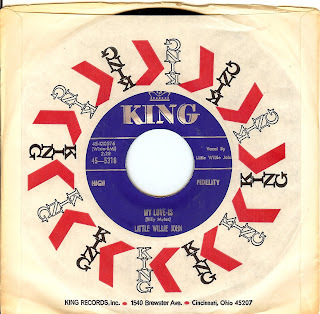 This may be the first post ever on this blog on a record from Cleveland, OH (although its' release on a Philadelphia based label made many believe for years that they were a Philly group and with their smooth sound it's easy to make that assumption). A smashing double sider, both sides have a great, dreamy quality. 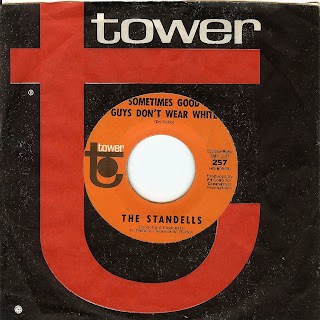 This was the groups debut single; they released a few more that sadly sank without a trace. Maximum (UK) R&B right here. The heartbeat pattern that the rhythm guitar and bass do throughout the song is completely mind-boggling. 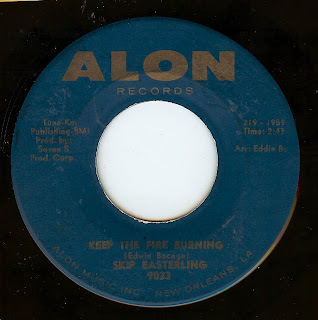 While he is little known outside of New Orleans (and soul collector circles) Skip Easterling is one of the finest (and under appreciated) "blue eyed soul" singers in history. 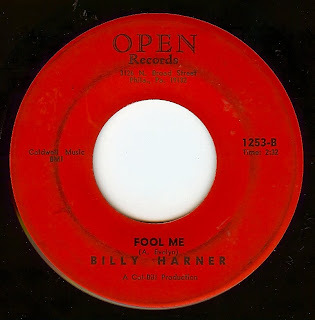 here, he is paired with NOLA genius Eddie Bo behind the board for an absolute classic of stomping Crescent City soul. 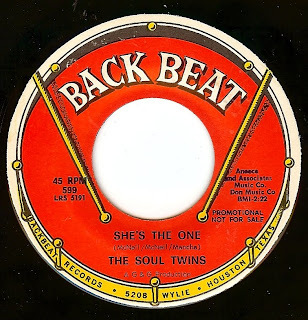 Even though this track has been a staple on the Northern Soul scene for ages, I am not able to find much biographical info at all about the group. As always, if you know anything, please write. This is a great song with an unusual stop-start arrangement and top notch performances. 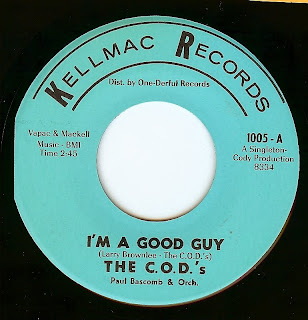 In the ongoing quest of featuring just about everything released by Gene (up til around 1970), here's another perfectly crafted piece of Chicago soul from the golden age. 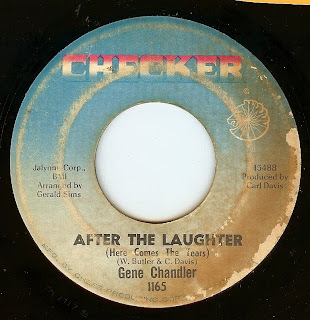 Even though the titles are similar, a completely different song than Wendy Rene's brilliant"After Laughter (Comes Tears)" which, by the way, has also been featured on this very blog. While this record from this group sounds a bit slapdash and perhaps under-rehearsed, it has incredible charm and such an infectious sound that it's easy to overlook the slightly out of tune backing vocals! 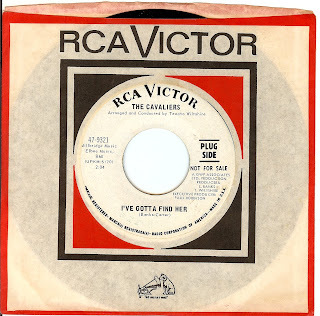 This Philadelphia singer, still an active performer to this day, was one of the greatest singers in the 'blue eyed soul" bag of the mid to late 60's. 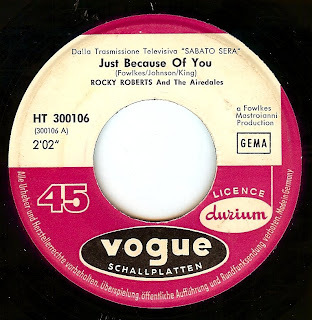 While he was known as a shouter (hence his nickname "The Percolator"), today I am partial to this deep soul track, which sounds so good on a late Sunday morning as I have some coffee and get ready for another day. Rocky was from Miami, FL but after a stint as a pro boxer and as a US serviceman (in the navy) he relocated to Italy, and began a successful career in Europe performing American style r&b, and also appearing on Italian and French TV and in a few 'B" films (including "The Wild Wild World Of Jane Mansfield"). The Italian producers did a great job, and this song sounds like a mating of Detroit and Chicago soul. 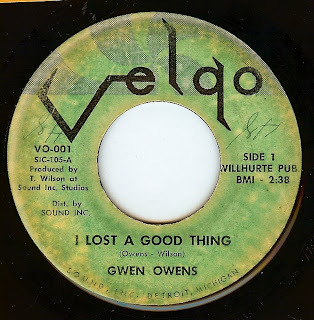 Hailing from Detroit, Gwen Owens was apparently still a teenager when this track was cut. Talk about precocious, with a seasoned voice like this! She cut a few more records on her own (which sell for massive bucks, but IMO this one is the best), then went on to work as a session backup singer, lead a group in the 70's and today, she is "back home" teaching music and singing at her church (in Los Angeles). Great to read that she is still singing. 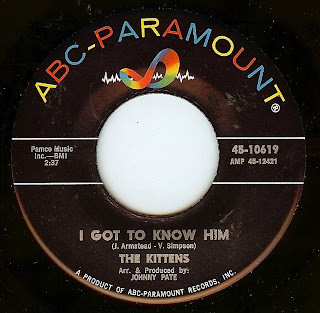 Yet another 60's soul song with "love" in the title? Well, yes, and this song has one of the most hauntingly transcendent choruses and it's a real thing of beauty. 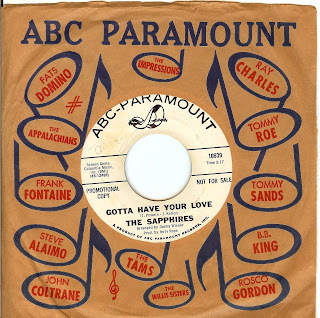 The Sapphires were lead singer Carol Livingston with male backups Joe Livingston and George Garner. By the time of this record it is believed that additional voices heard on the recordings include Melba Moore, Valerie Simpson and Nick Ashford all making up the dense sound. This group seems to have released a few records, but I can't find much in the way of biographical info on them (although I was happy to see that two members are performing in a vocal group together currently). This track appears to be the b-side; the other side is good and I almost featured it as well (it's a mid-tempo sweet soul track) but in the interest of conserving my precious bandwidth had to keep it off. BUT, this swingin' little number is somethin' else! These guys truly WERE twins! Hal and Harold Bergrattenreid made up this dynamic duo who cut a handful of very collectable 45's then disappeared from sight. I have no idea where they were from or much of anything else other than there is some MASSIVE heat comin' offa this record. 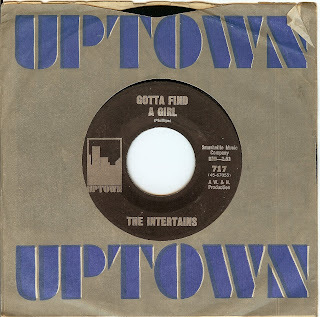 This Chicago trio experienced a number of lineup changes before this record was cut, but lead singer Patti Hamilton is the star of the show on this track with a mesmerizing performance (but I'm certainly not slagging off the note perfect backings from the other ladies). I'm also the first to admit that I'm a sucker for the Chicago style shuffling beats as heard on this track and the way that it maintains a relaxed but propulsive groove. In honor of John Lennon's birthday, here's a double post. Thanks to the "John Lennon's Jukebox" PBS special, we got to learn about a few more of John's favorite 45's (many of which we learned about through his guest DJ stints and John had impeccable taste!). Here's one from John's jukebox. I miss you, Mr Lennon and think about you every day. Funky records simply DON'T get any hotter than this! Easily matching the intensity of James Brown's best, this record, released at the height of "popcorn mania" ("Mother Popcorn", "Let A Man Come In And Do The Popcorn", etc) is one of the strongest records of the late 60's/ early 70's. 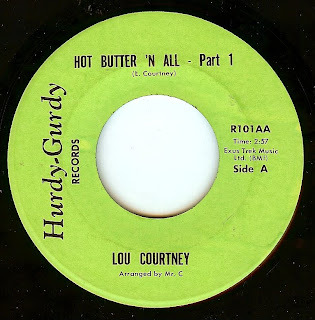 Lou was a NYC based producer who also cut a number of great records on his own (a handful of which have been featured on this very blog). Pt 2 is an instrumental continuation (billed as Mr. C & Funck Junction) that I recommend to all beat collectors; if you want it, just email me. This song has one of the most extraordinary vocal performances I have ever heard. 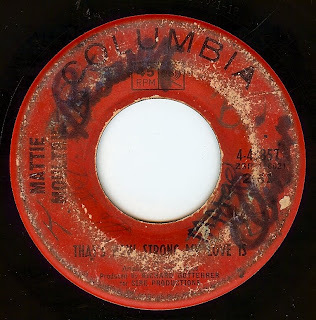 Amazing that this particular record can be heard at all (look at the condition of the label), but, as is so often the case with a 60's pressed 45, they can survive years of abuse, get deep cleaned and sound pretty darned good. Mattie's vocal performance is gospel influenced for sure (she has been a script writer and gospel singer for a number of years), and the performance simply soars into an orgasmic crescendo of passion and power. A great track from yet another great Chicago group. When this cut starts and the vocals come in, it sounds like it may be a bit lightweight; that is until the powerhouse lead vocal comes in (wish I knew the name of which one of the singers is taking the lead here). Another great track written by the dynamic duo of Jo Armstead and Valerie Simpson. 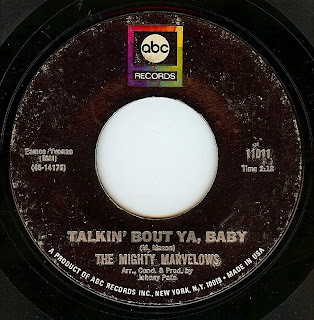 Yes, this is the same Chicago group that cut "I Do" (a very early 45 of the day pick on this blog) as The Marvelows (the name was changed to Mighty to avoid confusion with the west coast Marvellos whose 'Something's Burnin'" was featured here recently). This is one of those records that defines Chicago soul, with it's steady relaxed beat (perfect for stepping), great horns, and, of course, incredible vocals. Sometimes a funky instrumental just sounds SO GOOD on a Monday morning; don't you agree? 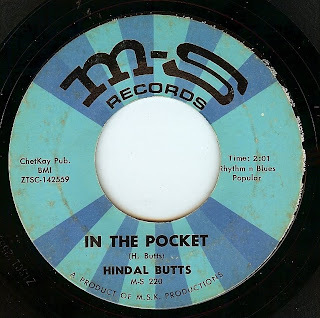 Hindal was a (mostly) session drummer in Detroit who cut a few sides under his own name, and this mover is probably his most revered cut. The lyrics are like a series of haikus, and the musical backing repeats the creepy vibe of "Fever". This is one of Willie's final singles (directly before the mighty "I'm Shakin", a past 45 of the day) before his (probably trumped up) incarceration and sad demise in prison. 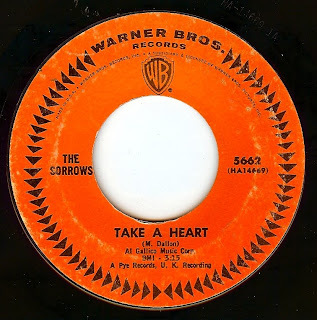 Careless Hearts spinning at 45 RPM! Available now. A very exciting day indeed! FINALLY a 45 that I actually perform on. 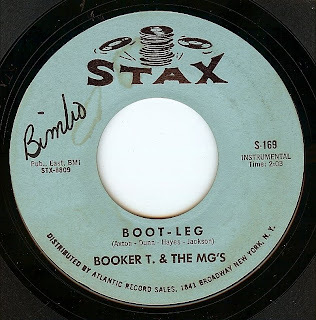 Being a 45 RPM fanatic since I learned how to walk, I've waited a long time to release some wax of my very own. Thanks to a "corporate sellout" on our part (Palm, Inc. using one of our songs for an ad) we were able to cut this record and release it on nature's perfect format. Recording, mixed and mastered completely analog (we even used actual tape echo!) by Brad McGowan, we are very proud of the results. Chceck out the sample below. NOW, your part. I'm hoping that since I've given y'all so much free music over the years, many of you will return the favor and buy our record! 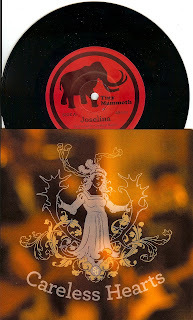 It's very inexpensive (and our drummer Eric Powers created a beautiful package with a 2 sided sleeve) so there you go. Here's a direct link to purchase it. We thank you in advance. If this link doesn't work, go here. Sure, "Dirty Water" has gotten most of the attention throughout the years and yes, it does contain one of the mightiest of all mighty garage rock riffs. However, in my opinion this song tromps all over Dirty Water and then some and holds up as one of the finest garage punk records of this era. Sure, it's not very "obscure" but it's also light years ahead of so many of the highly regarded rarities from the era. This has it all, snotty attitude, excellent anti-social lyrics, and best of all drumming that's actually steady! Yet another brilliant (and rare!) 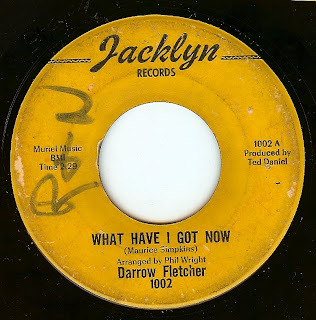 45 from Detroit's legendary Darrow Fletcher!